South Africa, 2013 , 97 min. 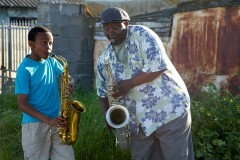 13-year-old Felix dreams of becoming a saxophonist like his late father, but his mother thinks jazz is the devil’s music. When Felix is awarded a scholarship for grade eight at an elitist private school, he defies his mother and turns to two aging members of his father’s old band to help him prepare for the school jazz concert.